This written test, given before and during preparatory training, evaluates trainees' knowledge of the MK 19. It also serves as an evaluation tool for the instruction. Training units prescribe procedures for the test, and announce scores of those who satisfactorily complete the test. If this test is used, it should be given before range firing. To satisfactorily complete the test, the trainee must earn 80 out of 100 points. Name the five major assemblies of the MK 19. Explain how to clear and disassemble the MK 19. Explain how to assemble the MK 19. Explain how to perform a function check. Explain how to apply immediate action to a runaway gun. Explain how to apply immediate action when a malfunction occurs. Explain one phase of functioning (directed by the examining officer). 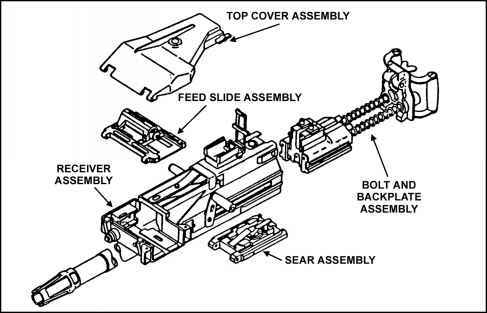 Explain why the weapon should not be fired with the top cover assembly open. Explain how to inspect ammunition before loading (belt to have at least one each of the following: short round, bent round, loose bullet, broken link or round not pushed fully into its link). Explain how to load to half-load position. Explain and demonstrate sight alignment.